Gilmer County is known as the "Apple Capital of Georgia" and the city holds the annual Georgia Apple Festival in October. Ellijay is the anglicized form of the Cherokee name Elatseyi, meaning "new ground". Other sources say it means "green place". Gilmer County was cut from Cherokee County in 1832, and Ellijay became the county seat in 1834. Ellijay existed as a remote mountain community until the Marietta and Northern Georgia Railroad (later the L & N) arrived in 1884. This prompted something of a boom in the timber industry, but the area remained relatively isolated until the Zell Miller Mountain Parkway (Georgia 515, named for Georgia Governor & U.S. Senator Zell Miller) was completed in 1991 providing easier access to the beautiful area. 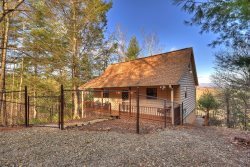 Start planning your Ellijay GA cabin rental today, we have many cabins to suite all of your needs. We can't wait to share our slice of heaven in the mountain with you. Contact our office today with questions or for additional assistance booking. There are so many things to do in beautiful Ellijay Georgia. Listed below are a few of the top activities and attractions for the immediate area.